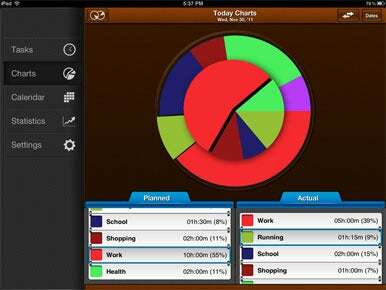 Schedule Planner Pro HD is an app for the iPad that enables you to keep a calendar and also track time spent on tasks, appointments, and so on. 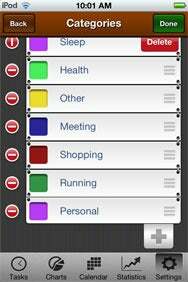 Schedule Planner Pro is a separate app for the iPhone and iPod that has almost the same functionality as the iPad version. Regardless of which of Intersog’s scheduling apps you use, you’ll find an elegantly designed offering. The interfaces of either Schedule Planner Pro HD or Schedule Planner Pro make it simple to create categories of your own to add to the pre-programmed calendar and task categories (work, health, rest, and so forth), to assign colors to each category you create, and to set the time for each task or event in your calendar. The apps also enable you to easily keep track of how much time you spend on each item, whether or not it has been prescheduled. A very nice touch allows you to view, in overlaid pie charts, the time you’ve scheduled for each category to the time you’ve actually spent on each category. Division of Labor: One nice feature in either Schedule Planner Pro or Schedule Planner Pro HD (pictured here) is its ability to show you how much time you’ve scheduled for tasks compared to how much time you actually spent on those tasks. On each device, you can sync Schedule Planner Pro with either your Google Calendar or the built-in Calendar app. Syncing, however, can be a frustrating task; I tested the process with my Google Calendar many times, and it didn’t work as often as it did. A few times, syncing worked partially, picking up most of my Google Calendar items, but mysteriously leaving others out. The syncing process seemed to work much more reliably on the iPhone/iPod touch version than on the iPad, at least in my experience. While Schedule Planner Pro and Schedule Planner Pro HD have many drawbacks, they are nicely designed and work well; if you carry an iOS device with you most of the time, as many people do with the iPhone, syncing may not be much of a problem. The apps provide several ways to remind you of scheduled appointments and tasks. Via the settings panel, you can set a default reminder for each appointment (between 0 and 60 minutes before the scheduled start time). When you schedule each event individually—which is done in the day view rather than the monthly calendar view—you can also schedule an additional reminder for any time during that particular day. Color Coordination: Both versions of Schedule Planner Pro enable you to easily add and delete categories and change the color associated with each category. I have been using Google Calendar for several years as my main calendar, and one of the things that I appreciate the most is that service’s ability to send multiple e-mail reminders or notifications for a particular meeting or event. For example, I’ll sometimes remind myself of an important event one week, one day, and four or five hours before it is scheduled. Compared to this, the Schedule Planner Pro apps’ reminder capabilities are very limited. You can choose from among seven different sounds for your notifications (or you can choose no sound), and you can set them for your tasks’ start time and finish time. You can also set notifications for the actual start and finish times, rather than scheduled ones. It’s not clear how you are notified if you have turned sounds off. The daily view provided by each app is especially nice. Two tabs are displayed at the top of the screen; tap one to view the day’s planned events and the other to view what you’ve actually accomplished. (In this view, you can also enter start and end times for either planned or unplanned items.) You can rearrange tasks in the day view, and you can also cut and paste both planned and completed tasks between different days. You can also, in theory, sync with your Google or iOS Calendar in the daily view. But I could not get this feature to work; although I specified in the settings panel that I wanted to have schedule planner sync with my Google Calendar, whenever I tried to actually do so in the daily view, I got a an error message saying that I had not chosen a calendar to sync with. The bugs and limitations mentioned above may prove to be considerable drawbacks for some users; for others, especially those not concerned with syncing, they are relatively minor. In any case, both apps are well-designed and offer simple and elegant interfaces that will probably be appealing to most users.